A triple ko is a game state where there are three kos on the board, all in play at the same time. They can be typically part of the same configuration, as in the first example. Say you have the kos a, b and c. Black takes a, White takes b, Black takes c, White retakes a, Black retakes b and White retakes c, repeating the original position with the same player to play. Under the simple ko rule, Black could now retake a again, and the cycle would go on forever. The position we started with reappears. 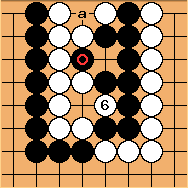 Under superko rules White is prohibited from playing in the above example, because that would repeat the original position. Instead, white can play a ko threat, and if black responds the cycle can start again (with at , and at being prohibited). In this example, the combined state of the three kos may be imagined in three dimensions as the vertices of a cube, where the three dimensions (x, y, z) represent the state of the three kos (B/W). 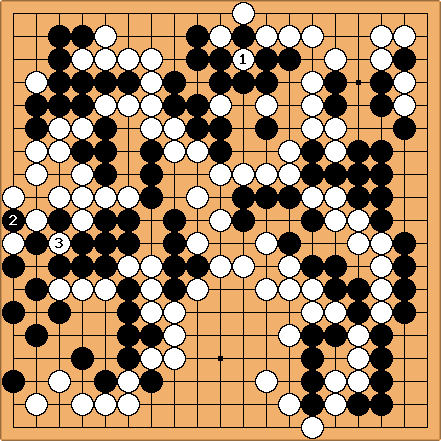 In the two states BBB and WWW one side has finished the ko by capturing; the ko is still active in the other six states, which are all used in the sequence above. Imagining the cube with the long diagonal between BBB and WWW vertical, the remaining six vertices form a zig-zag belt round the middle; the above sequence moves around that belt. If we were to have four kos in one fight, there would be ``2^4 - 2 = 14`` live states and there would be various ways of traversing them, but again it would eventually repeat. It would, however, be significantly harder to keep track of what moves were still legal. In general ``n`` kos correspond to an ``n``-dimensional hypercube, having ``2^n - 2`` live states. 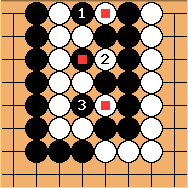 An example of a triple ko that is not a single configuration is a simple ko with a double ko seki that each player can use for ko threats. This arose in the O Rissei – Cho Chikun triple ko shown below. Of course, a process going on forever is undesirable. Traditionally, a triple ko meant no result, and was considered unlucky. Several modern rulesets handle it with a superko rule, under which it is similar to a regular ko: they forbid repeating a “state of the game”, where different variants include different factors in the state. Honinbo Sansa played a famous historical game involving a triple ko in 1582, against his rival Kashio Rigen. The game was played in the presence of Warlord Nobunaga at a monastery in Kyoto. Due to a triple ko, the game was suspended without result. The next day Nobunaga's ally Akechi Mitsuhide rebelled, surrounded the temple, and killed Nobunaga. After this, a triple ko was considered bad luck. In October 1998, the fourth game``color(red)(""^("Dead link 2019-02-12"))`` of the Meijin title match ended without result when neither O Rissei nor Cho Chikun would yield in a triple ko. Here are the first three moves in that triple ko. In December 2005, a triple ko occurred in the semi-finals of the Samsung Cup in a game between Luo Xihe and Choi Cheolhan. The officials were already discussing the possibility of arranging an extra lightning game in case of a draw, when Luo Xihe elected to give up the large (23 stone) group involved in the triple ko in exchange for compensation elsewhere. It turned out that his counting was accurate, as he went on to win the game by 7.5 points. On June 28th 2007, during the 14th Agon Cup in Japan, a game between Kono Rin 9p and Akiyama Jiro 8p ended in a no result due to the emergence of a quadruple ko. From the inception of the Nihon Kiin on 24th July 1924 till 30th June 2007, there have only been 19 instances of no result recorded. Of the 168 813 games played by Nihon Kiin professionals in this period, only 19 have yielded no result, averaging about 1 no result game every 9000 played. (Translated from an article in Weiqi Tiandi 2007.15). Hence if you cannot find too many triple ko games, do not get too disheartened, they are rather rare. For a list of 20+ triple kos, see Triple Ko. 1980-05-25, Matsuoka Akira – Yanagawa Hiromasa? 1984-05-24, Qjan Yuping? – Katoka Satoshi? RobertJasiek: Such a configuration is not consistently called "triple ko". It can also be called "position with both a basic ko and a double ko seki". Regardless of what the ko shapes are called as shapes, their behaviour might be similar to that of a triple ko shape. So one might speak of a "triple ko behaviour" although one does not need to call a "triple ko shape" where there is none.